Catamarans are becoming more and more popular on bareboat charter holidays as they provide a lot of comfort and space. Especially if you spend the charter vacation with a larger group you may enjoy the extended deck space and large communal areas, the bright salon, more stowage possibilities and comfortable cabins. Because multihulls are bigger, it goes without saying that they are also more expensive than monohulls of the same length. Since years, catamaran rentals enjoy a growing popularity. The share of catamaran booking reaches nowadays 20 - 25 %. Most of the catamarans in yacht charter are sailboats. There are only a few so called "Power-Cats" available for yacht charter that do not have a sailing rigg and run only by engine power. Popular catamaran brands are Lagoon, Fountaine Pajot, Nautitech, Privilege, Bali or Catana. What is steadier – a monohull or a catamaran? Stability-wise a catamaran is steadier. It almost does not heel under sails. When underway, a monohull sailboat leans into the wind and it can get a bit tricky to do things like walking, cooking etc. To rent a sailing catamaran in Spain, just select your favourite harbor. Catamarans have a shallower draught because they do not have a keel. Therfore you can move and anchor closer to beaches and deeper in protected bays. It would also be possible on most catamarans to `dry out´ and run aground if need be or at low tide. Furthermore, catamaran boats providing more stability at anchor because they do not bounce that much when there is a swell. Is cruising faster on a catamaran or on a sailing yacht with one hull? Without the heavy lead keel, catamarans are much lighter than their one-hulled relatives. Thank to this property multihulls generally sail faster unless they are loaded quite heavily. This sometimes occurs due to the extended stowage space and large water tanks. Catamarans have a problem going upwind, so in this case they need to use motor power earlier than monohulls while tacking against the wind. With much larger surface areas they constitute a bigger obstacle in the wind. Cats are great for sailing downwind courses and can go up to 10 knots and more when sailing surfing with the waves. Which one is easier to navigate – monohull or catamaran? Even though catamarans provide so much more space than monohull sailing yachts they can easily be managed by a single couple. The only thing is that the distances between winches and equipment could be larger due to the two hulls. A huge asset of a multihull is the two motors with which you can turn the catamaran 360° on the spot. This makes manoeuvers in tight spaces very easy. How safe is sailing with a catamaran? Generally, you cannot say that cruising with a catamaran is safer than with a sailboat in relation to weather hazards. However, due to the extended space and horizontal decks it is a little bit safer or easier for a larger group of people to move around. When the sea gets rough, children can be kept inside the boat, in the salon, without giving them the feeling to be locked down in the "cellar". Overall multihulls provide a lot of steadiness for your charter holiday. With their two motors, catamarans can also carry on easily in case of an engine problem. Once used to steer a acatamaran, the mooring with a catamaran is less likely to cause problems compared to a monohull. Thanks to the two motors, multihull boats are able to turn on their own axis and can be manoeuvred very precisely and predictably. How is the interior different on a catamaran and on a sailboat? The salon on a catamaran is usually located at the same level as the cockpit. The salon of a catamaran is more spacious than on a sailboat and offers very bright 360° views. Catamarans generally provide more space and more stowage possibilities. The cabins tend to be more comfortable and identical than on a monohull. Ideally, a catamaran has four cabins of the same size, each with an en-suite bathroom. Because they are located in two separate hulls, this leads to more privacy than on a sailboat. You can put up different groups in each hull – for instance parents in one and kids in the other, or you can split the two hulls between individual couples. In addition, you might find cooking easier in a catamaran galley as those boats are steadier. What are the prices of a catamaran vs. monohull? Generally, charter prices for a catamaran are around 30 - 50% higher than for a monohull. But of course you receive a lot of more space and comfort for your money. Alone the cabins of a catamaran will appear to you like a little appartment if you are used to monohull dimensions. Depending on where you are, marinas charge a surplus for the wider space needed on a multihull. Yet while mooring fees may be expensive with a catamaran, due to its stability and shallow draught you have much more possibilities to anchor than on a sailboat. 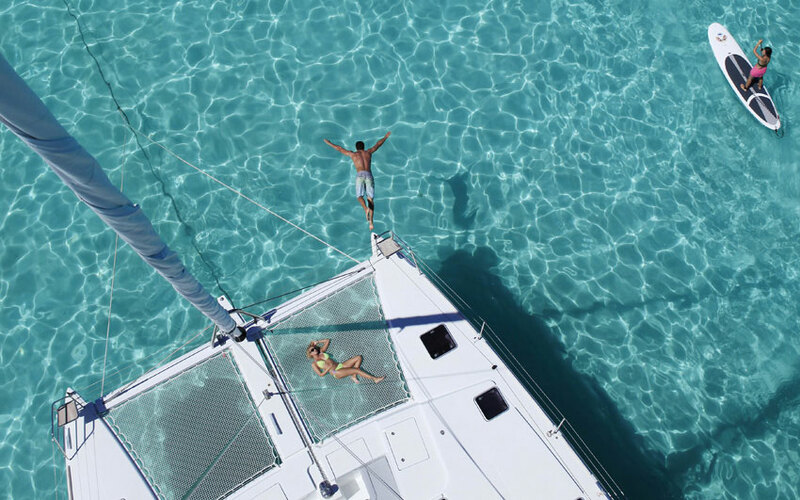 You can rent a catamaran from almost all charter ports in the Mediterranean as well in the tropical charter destinations like the Seychelles, the Caribbean and in Polynesia. Rental catamarans over 49 feet lenght mostly are offered as crewed charters with skipper and or hostess. With our YachtFinder you can compare charter offers for catamarans and book them online. Also try our Specials listing for discounted catamaran offers.